Zimbabwe’s economy is in chaos including sharp price hikes, a new tax on electronic transactions and daily shortages ranging from fuel to bread. 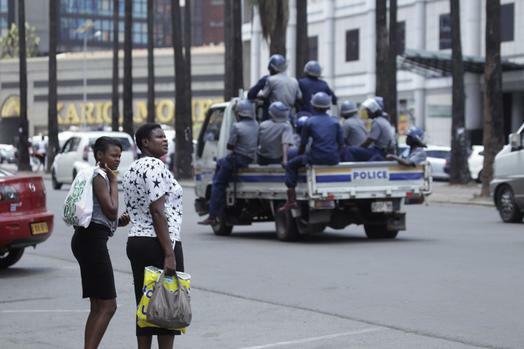 Zimbabwe police arrested trade union leaders and scores of activists on Thursday ahead of planned marches over the country’s worsening economic crisis, lawyers said. Peter Mutasa, president of the Zimbabwe Congress of Trade Unions (ZCTU) – the country’s largest trade union – was among those detained, along with activists in several other towns. Mutasa had called for protests in Harare on Thursday despite a police ban on public gatherings due to a recent cholera outbreak. There were no protests after a court upheld the ban in Harare, while a small crowd gathered at trade union offices in the second city Bulawayo. Large numbers of armed police were on duty in both cities. The ZCTU had planned national protests against sharp price hikes, a new tax on electronic transactions and daily shortages ranging from fuel to bread as Zimbabwe’s economy endures a fresh bout of chaos. “I confirm the arrests of ZCTU president Mutasa and secretary general (Japhet) Moyo at their offices and scores of other unionists in Harare, Masvingo and Mutare,” Zimbabwe Lawyers for Human Rights spokesman Kumbirai Mafunda told AFP. Scuffles erupted as police arrested the ZCTU leaders at the unions’ headquarters in Harare. Zimbabwe’s moribund economy has hit new lows in recent days with shops struggling to stock shelves, medicine running out and long queues outside petrol stations. The local “bond note” currency, which in theory has the same value as the US dollar, has been in freefall in recent weeks, raising fears of a return to the hyper-inflation that wrecked national finances in 2009.